Step in with The Walking Dead this Halloween! Graduate SIF Fellow John Horhn has partnered with the impressive fan-site TWDLocations.com to show their chronicled work of AMC’s The Walking Dead on ATLmaps. 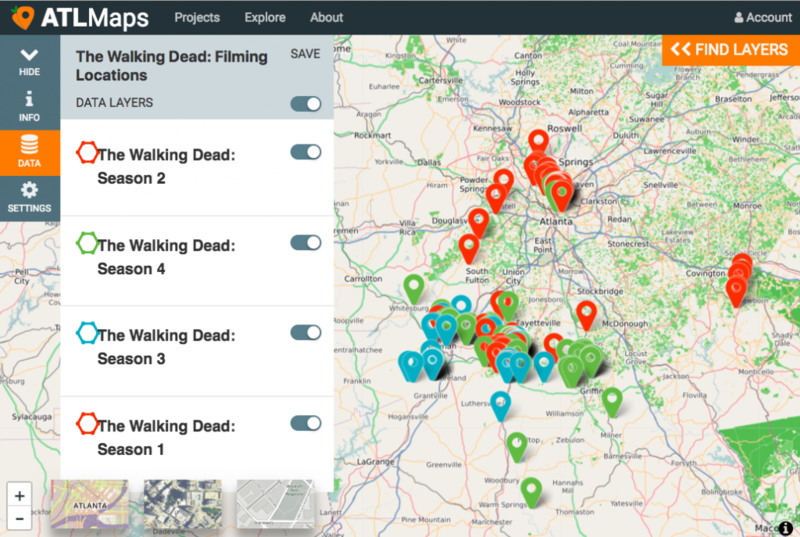 “The Walking Dead: Filming Locations” story-project stacks map layers that show filming locations of the series in which each map layer is a season of the series. Seasons 1-4 are presently available in this project, with Seasons 5-8 shortly forthcoming. Locations of Walking Dead episodes displayed on ATL Maps. The Walking Dead is one of the most iconic television dramas of our time. The series is set in a post-apocalyptic world that links Georgia with a chaotic reality filled with symbolism, moral relativism, and most importantly, zombies. The production of the television drama has resulted in a huge amount of revenue and attention being focused on Georgia’s burgeoning film industry. The series has also captured the imagination of fans around the globe and generated a tremendous discussion and media attention. One team of especially dedicated fans created TWDLocations.com, a site dedicated to identifying and compiling the real world filming locations for The Walking Dead, with the ambition of providing the fanbase with a tangible way of engaging their favorite series. ATLMaps is proud to partner with the TWDLocations to produce this digitally mapped presentation of the filming locations for the most infamous scenes of this new American classic. It is our hope that this new interpretation of The Walking Dead does justice to a subculture of fans who have devoted themselves to visiting TWDLocations. Whether you are fans of the series simply seeking a way to achieve a deeper connection with the show, or film fanatics who are in need of a guide through this zombie filled world, the TWDLocations mapping project featured on ATLMaps is just what you need to find your path through the frightfully addictive world of The Walking Dead. Television series like The Walking Dead are the new cultural connective tissue of 21st century American society. These narratives provide viewers with a point of confluence for the discussion of ideas and lifestyles as evidenced by the wildly successful spin-off talk show, The Talking Dead. However, these shows also enable researchers and media specialists the opportunity to experiment with different digital platforms like ATLMaps. ATLMaps was able to use the data gathered by TWDLocations to create a new way of exploring The Walking Dead interactively season by season. ATLmaps curators were able to take map files filled with production geospatial data and convert the data into XLS spreadsheets. The XLS files were then scrubbed meticulously to produce data compatible with our platform, and then uploaded through the backend of the ATLmaps site. This process was done for each season of TWDLocation’s data. It is our hope that this new interpretation of The Walking Dead does justice to a subculture of fans who have devoted themselves to visiting TWDLocations. Whether you are fans of the series simply seeking a way to achieve a deeper connection with the show, or film fanatics who are in need of a guide through this zombie filled world, the TWDLocations mapping project featured on ATLMaps is just what you need to find your path through Halloween.